PLEASE NOTE: IQ Option robot is not available. Official iqoption project has been closed. It’s not supported anymore. Automated trading robots to work with IQoption. There are no third party robots compatible with IQ Option broker. But just recently IQ Option launched new official robots platform. Yes, from now on you can create and customise your own IQ Option Robot. All IQ Option traders waited a long time for this moment. 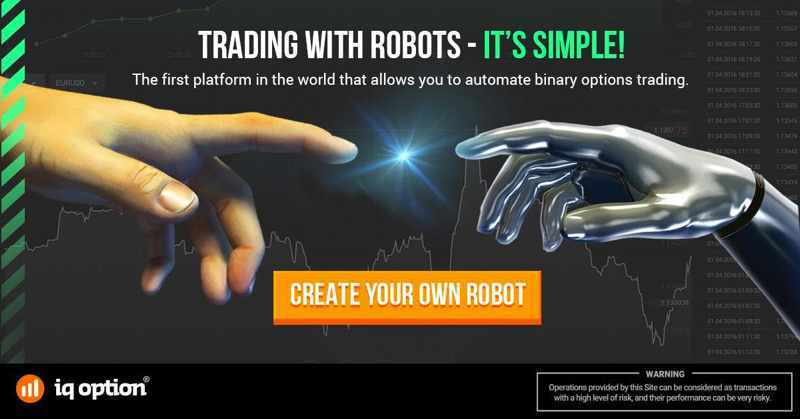 If the Robots Platform is such a good and sophisticated as trading platform then IQ Option Robot should be a big success and should bring a lot of new traders to IQ Option. This is the first platform in the world that allows you to automate binary options trading. The creation of the robot can be a simple task or a complicated one. It all depends on your experience and needs. The best of all the IQ Option autotrading platform is completely free to use. You can pick successful robots from the list – there are robots created by other traders which had a good results. Is it possible to use automated robots on IQoption? NO, IQ Option robot is not available. Official iqoption project has been closed. It’s not supported anymore. Does somebody know a good set up for the automated robots for IQoption? What do you think about new IQ Option Robots platform. Is it any good for autotrading? Does IQoption robot provide a good and consistent results? Please leave your comments or ask a question below. Please help the others. can you give me link binary option robot for iq options only. I dont want another broker unless iq options only for binary option robots thank you for your help. So far there are no autotrading robots for IQ Option platform. But it is possible to create one using a virtual engine and some really advanced coding. My team, consisting of myself and another 7 senior IT Engineers, is able to do this but it will take approximately 3 months and will cost US$20,000 more or less. This cost is solely for for our remuneration since the eight of us will not be working on any other project during this period. anyone who is interested in sponsoring this project may contact me on hmebert1980@gmail.com. i asked, it is coming soon, by end of this month. does the iq option have an automated robot?